The DateTimePicker control provides a single, intuitive UI for selecting date and time values. The TimeEditor control provides a simple masked editor for time values only. You can edit your date and time values by using the spin buttons, using the keyboard arrows, or by typing in fields. Choose from three edit modes: DateTime (default), Date, and Time. Select from preset date formats, including Short and Long. Choose from preset time formats, including ShortTime, LongTime, and TimeSpan. The DateTimePicker and TimeEditor controls support spin (up/down) buttons for selecting date and time. Define the cultural setting for date and time formats. 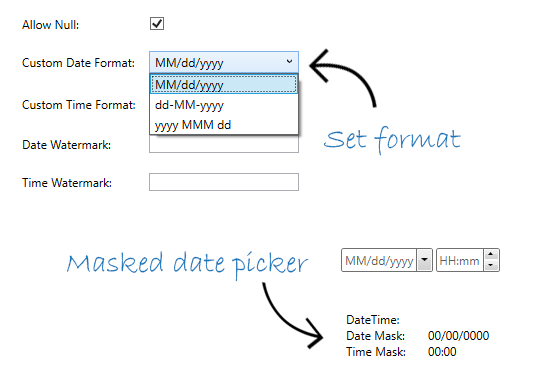 The DatePicker control supports custom date formats and masked input. The edit mask prevents end users from entering invalid characters into the field. By default, you can enter null values in the DateTimePicker and TimeEditor controls. You can disable this by setting the AllowNull property to False. Because DateTime Editors for WPF supports ComponentOne ClearStyle technology, you can easily change control brushes without having to override templates. By setting a few brush properties in Visual Studio, you can quickly style each part of the control.